We invite you to register to be a judge at the 2019 Design Expo on Thursday, April 18. 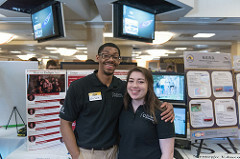 The Expo highlights hands-on projects from more than 1000 students on Enterprise and Senior Design teams. Although special expertise is appreciated, judges are not required to be technological specialists or engineers. If you like engaging with students and learning more about the exciting projects they are working on, please consider judging. If you would like to serve as a judge at this year’s Design Expo, register as soon as possible to let us know you’re coming. Thank you for your continued support. By Pavlis Honors College and the College of Engineering.